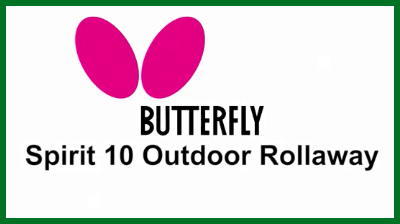 The Butterfly Spirit 10 Outdoor Rollaway is part of Butterfly’s new range (launched for 2016). The 10mm thick top is made using treated plywood. To store you simply remove the net and post set and then each half is folded using one catch. The legs are adjustable for levelling and the package includes 2 bats, 3 balls and a cover. If your budget allows the Spirit 12 offers a slightly better bounce whilst the Spirit 18 is significantly better (also boasts a stronger frame). However this does increase the weight of the table to 96kg for the 12 and 133kg for the 18. Delivery is free and is usually 3 - 6 working days. You will be called by our couriers to book a convenient delivery day. Please call 01371 875000 if you require more information. The net & post set is supplied free by Butterfly as part of the table package. Some retailers claim they themselves are giving this as a 'free of charge' extra and even include it as part of the total value of the free accessories they offer!